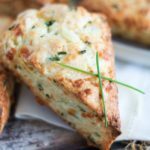 Buttery scones combine with the intense flavor of sun-dried tomatoes in this savory breakfast option. 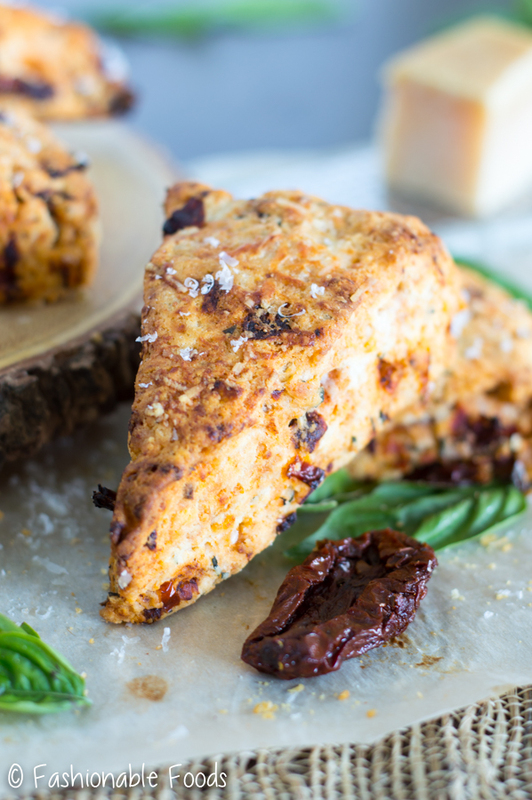 Sun-dried tomato basil scones make the perfect accompaniment to soft scrambled eggs for a weekend brunch! Hello again, friends! I’m beginning to think I should have called this blog “Tacos and Scones”… since the majority of my posts consist of one or the other. ? What can I say? I love a good scone… and a good taco. In my defense, the last scone recipe I shared was back in April. Obviously I was due for another! And what a better choice than a savory option. 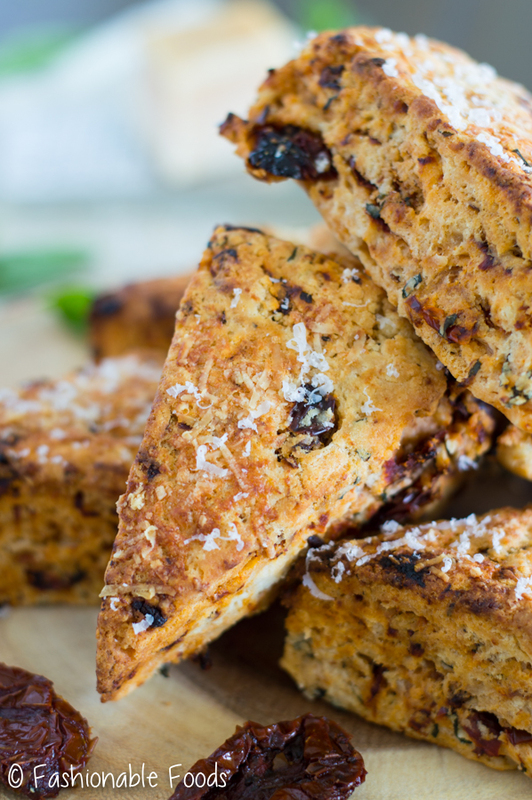 Before we jump into scone heaven, how was your weekend? I’m having trouble remembering what I did all weekend, so it couldn’t have been that eventful! I know it was a lot of around-the-house stuff, but the specifics are escaping me at the moment. I hope your weekend was more eventful than mine. Now, let’s jump on into scone heaven! This recipe starts out like any other of my scone recipes. Flour, a pinch of sugar, baking powder, salt, butter, and instead of cream we are using sour cream. 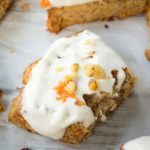 The sour cream makes the dough super soft and adds a nice tang. The mix-ins here include parmesan cheese, fresh basil, and the star: sun-dried tomatoes. I happen to be a huge fan of sun-dried tomatoes. That intense, sweet tomato flavor is SO good. Paired with parmesan and basil makes it even better! Combine that all into a buttery, flaky scone? Heaven, people. Pure heaven. 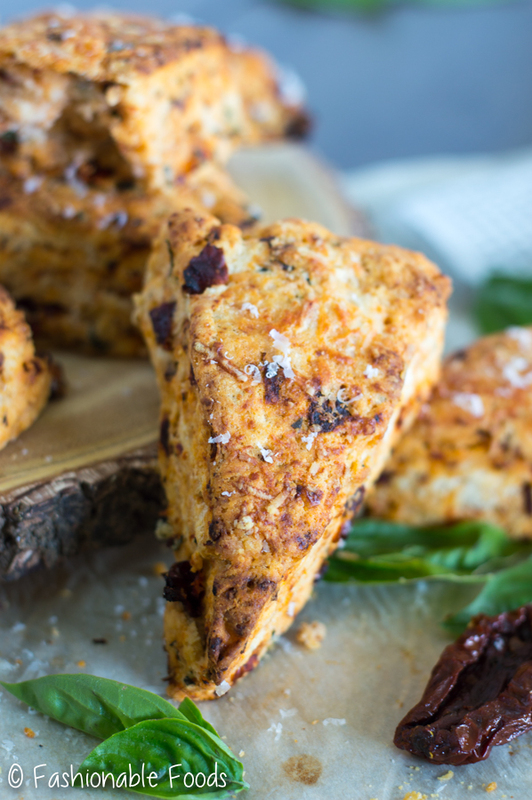 We enjoyed these scones with scrambled eggs all week long.. what a perfect way to start the day! They would make a fantastic addition to any breakfast or brunch, though. Due to some internet difficulties right now, I’m going to cut this post short. Hopefully I can get it posted before I lose connection again. Technology can be SO incredibly frustrating! Anyway, you should totally go make these scones. 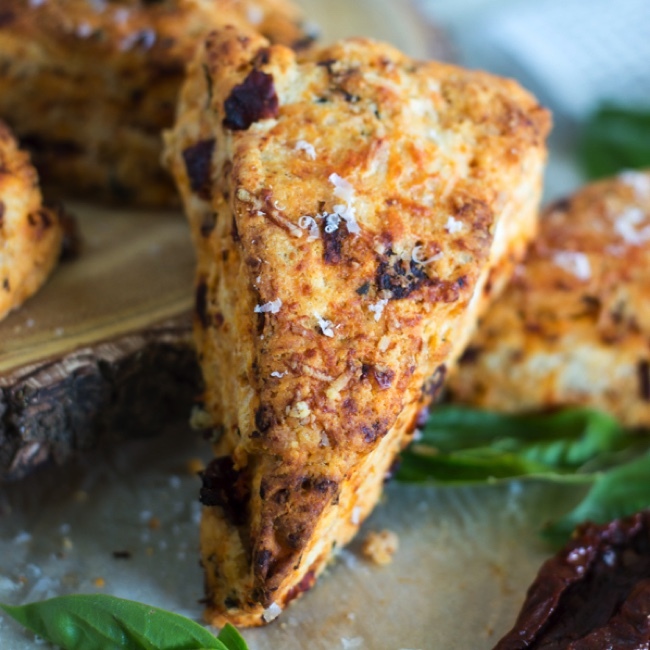 Sun-dried tomato basil scones are a great way to liven up your breakfast… and they are pretty simple to make, too! Until Friday, my friends. ✌? In the bowl of a stand mixer, combine the flour, xanthan gum (if using), sugar, baking powder, salt, all but 2 tablespoons of the parmesan cheese, and basil. Mix with the paddle attachment until just combined. Add in the butter cubes and mix on low speed until the butter breaks up and the dough resembles coarse crumbs. Add in the egg, sour cream, and sun-dried tomatoes. Mix the dough until it’s just combined. It should be soft and not too sticky. Turn the dough on a floured surface and press into a 1-inch thick disk. Cut the scones into 8 wedges and place on a parchment-lined baking sheet. 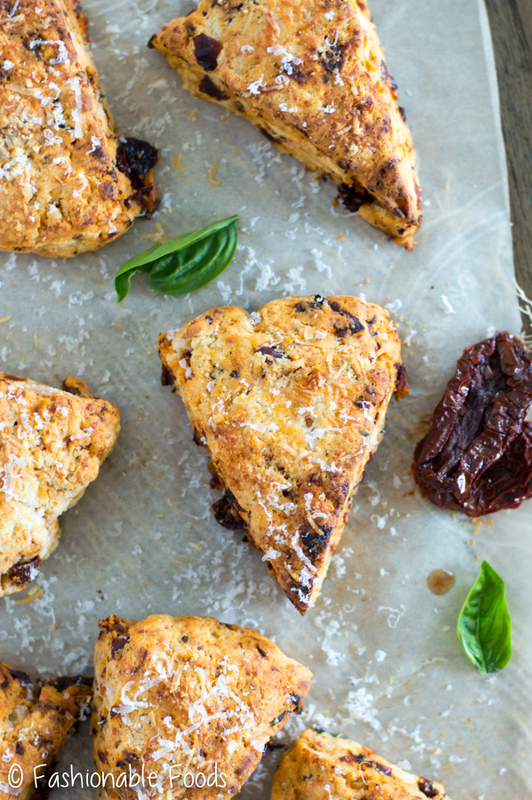 Transfer the scones to the fridge to chill while you preheat the oven. Once the oven is preheated, remove the scones from the fridge and brush with melted butter. 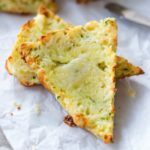 Sprinkle the remaining 2 tablespoons of parmesan cheese over the top and bake the scones for 18-20 minutes, or until golden brown. These scones are best served warm, but cooled leftover scones can be reheated in a low oven until warmed through. These buttery scones look so divine, Keri. 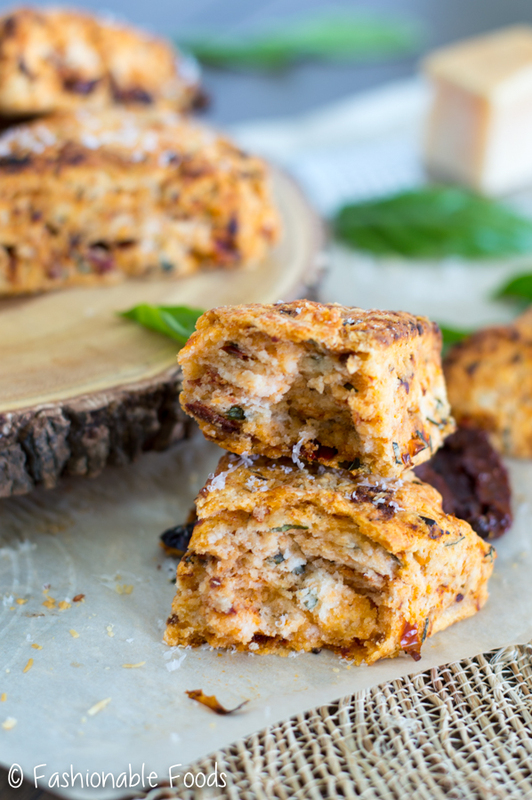 Sun-dried tomatoes and basil sound like a great combo. Indeed they would make a perfect weekend brunch.